The road into Kew, North Caicos. The page refers to the village of Kew on North Caicos. For the region on Providenciales, see Kew Town. Kew is very interesting place to drive through. 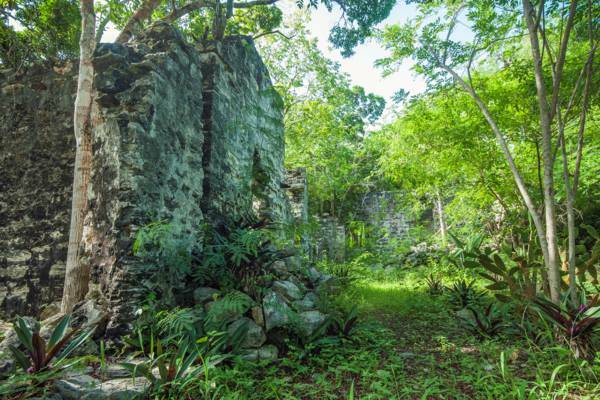 Considered to be the garden of the Turks and Caicos, the small houses here actually have lawns and large trees are common, unlike the more desert-like and weather-beaten yards found in the rest of the islands. 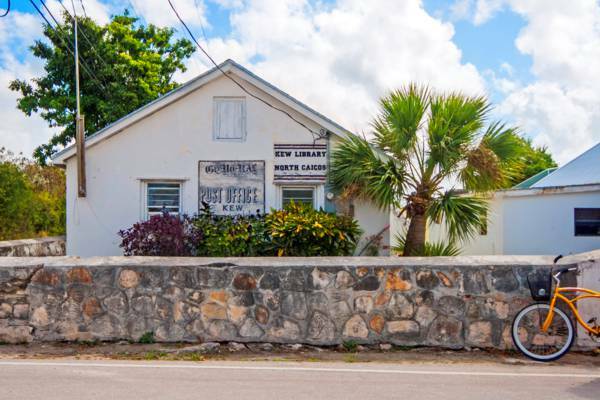 Other than small houses and churches, only a few tiny shops, a small clinic, a police substation, a satellite location of the Turks and Caicos National Trust are found here. Located close to Kew are the attractions of Wade's Green Plantation, Cottage Pond, and the Government Farm (North Caicos). The island's main cargo port of Bellefield Landing is also nearby. There are a few rental units available in Kew, but in general most guest houses and villas are located on Hollywood Beach, Whitby Beach and Horsestable Beach. The ruins of Wade's Green Plantation near Kew. The southwest region of North Caicos was the centre of agriculture in the Turks and Caicos during the Loyalist era in the late 1700s and 1800s. Initially, sea island cotton was the preferred crop of the Loyalist planters, yet later on sisal (a fibrous agave used to produce rope) and limited amounts of sugar cane was also raised. The locations Kew and Sandy Point on North Caicos, and Parrot Cay and Pine Cay have historically seen the greatest amount of precipitation of anyplace in the Turks and Caicos due to their position northwest of the extensive marine tidal flats of the Caicos Islands. Heated and humid air, rising off the wetland flats, condenses at altitude and results in rain, which the constant east-southeast trade winds blew to the above mentioned areas. Because of the above-average rainfall and also due to the fact that the Kew region is the farthest one can get inland in the Turks and Caicos, the country’s best fresh water lenses are found here as well. In 1971, the British Institute of Geological Sciences conducted a nation-wide survey of nature water resources in the Turks and Caicos. They found that the fresh water lenses at Kew were both the thickest at thirty feet (9m) in a few places, and quite fresh at 178 ppm (parts per million) of salt. In contrast, the best well on Salt Cay, located near Northeast Point, yielded a lens only a few feet thick, and salinity of 4350 ppm. Kew, North Caicos is named after Kew in Richmond, England. Kew and Richmond in the United Kingdom feature long, linear ponds which feature scenic trees along the edge. Kew in North Caicos has similar geographical features (which are unique in the Turks and Caicos), and the original settlers chose the name Kew for this reason. Last reviewed by an editor on 13 August 2017.